This John Guest fitting is installed in Everpure QL3 Heads on the outlet port to restrict water flow to 0.5 gallons per minute (GPM), per Everpure's specification. The same fitting without the flow restrictor is installed on the inlet port of the QL3 Head. Fitting can also can be used for other applications where .5 GPM Flow is needed. 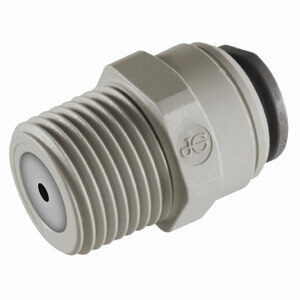 The fitting accepts 1/4" OD Tubes and has 3/8" MPT.